Click to Enlage, if you have to do so to read the numbers. Certain "critics" of the BLUFF CREEK FILM SITE PROJECT have repeatedly cropped up saying things like we have not been open with the results of our PGF site research, and have been "secretive" about the true site location and coordinates. REALLY? I suppose the 72 videos we have done so far were not enough? Nor all of the blog entries right here that discuss the matter? 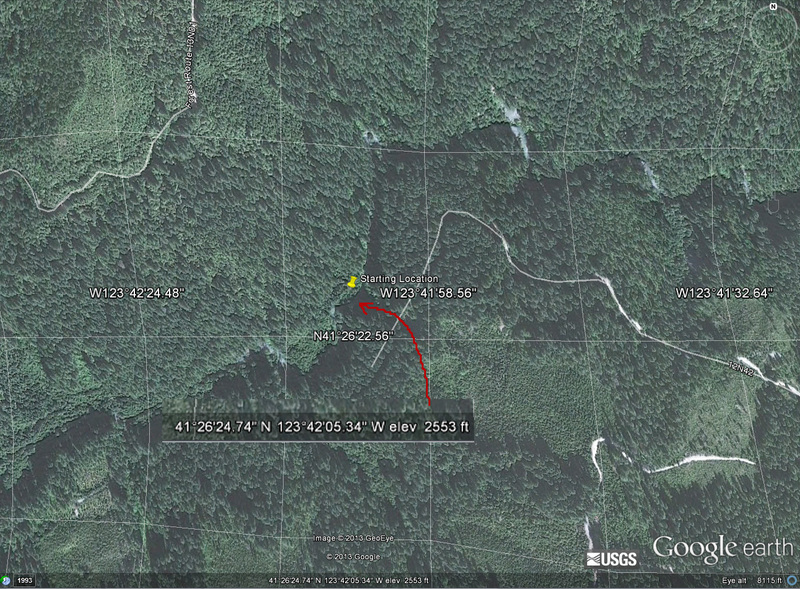 Not even the maps published here that show exactly where the site is, along with GPS locations clearly marked? Not all the countless phone calls and visitors I've spent endless hours with in helping them find the place? Oh well. To make it easier for everyone... HERE THEY ARE: 41,26.412, -123,42.115. Upper Bluff Creek, area of the PGF stie. 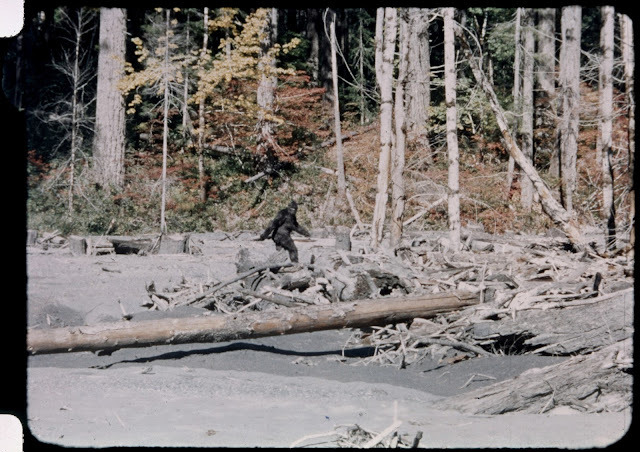 The Bigfoot film action occurs around "Leiterman 2 up to "Big Stump." These readings were taken by Ian C., BLUFF CREEK FILM SITE PROJECT founding member around the area and at the film site. The two "Leiterman" readings are the film site itself, added later to the above, though the reading for the upper maker was incorrect due to poor satellite reception down in the canyon at the time. The lower reading may be used on Google Earth and other places to find the exact position of the start of the film action. Some of the points above are off the map given, but still in the area, and may be useful to all. 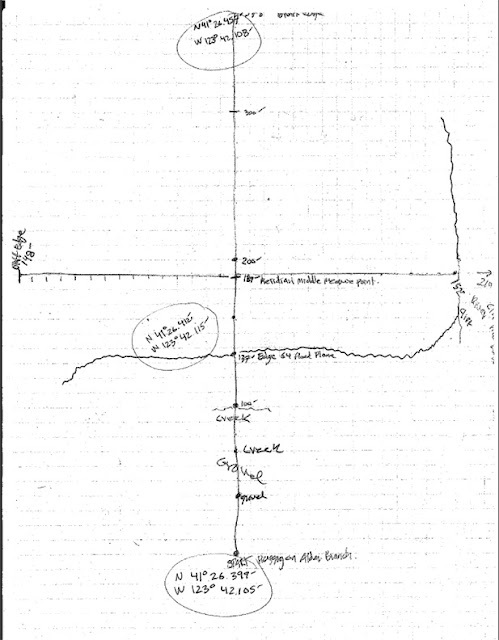 Here is an early map sketch published a LONG time ago now on this blog. the memory of Bob Gimlin. CLICK TO ENLARGE. From Ian: "Finally dumped my GPS onto the computer. The actual coordinates are below. 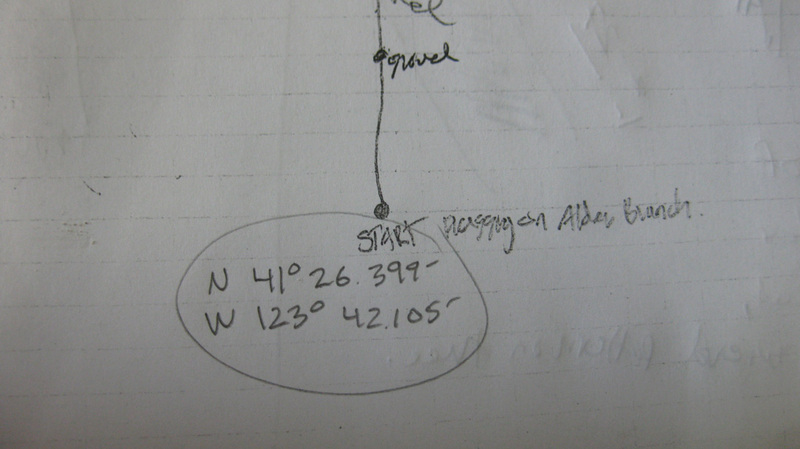 The Leiterman waypoints are from the grid work, I manually added them. The Leiterman1 location is certainly bad, it is about 200 vertical feet above the creek! However, that is what you get from a GPS down in there. The rest of my waypoints I have very high confidence in; they match up well with where I thought I was on the map at the time." In case that wasn't obvious enough, here it is again, BIGGER. Here is the latest map of the area that we have done. It is still being expanded and slightly revised. Note the GPS readings are on there, too. 2012 PGF Site Map. CLICK TO ENLARGE. Here is what it looks like on Google Earth. Note that their notation differs in formatting. Google Earth, around the PGF site. CLICK TO ENLARGE. Thanks for reading, this time. I do hope I don't have to answer these same questions over and over again for the rest of my life. Here are some images for you of the trip we did there this last summer, just for fun. Here is a group photo from down in Louse Camp. Cliff Barackman, Ian C., Rowdy Kelley, Todd Hale, Jamie Snowhorse, Robert and Francis Leiterman, Bart Cutino, Terry Smith, James Bobo Fay, Bill Munns and myself. Steve, Ian, Robert and Rowdy, in front of the Big Trees. Here is an image of Bill Munns just after he first saw the Big Tree, and then started pointing out the others seen in the background of the PGF. 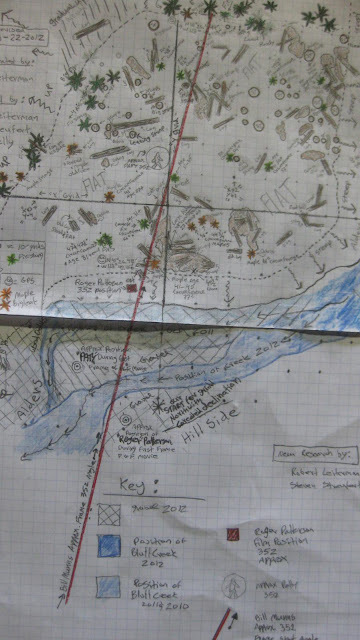 Here is a travelogue with descriptions of the route that Ian C. (crazy_ian) published on the old Bigfoot Forums back in 2007 from a trip in 2006. NOTE: Some factors may have changed since then. Enjoy. The film itself has been discussed and analyzed on for almost 40 years. I will not try to add to the great information already in print and online. In short, I find the film very compelling evidence that there is a large unknown hominid roaming the Pacific Northwest, for the basic reason that in four decades no one has been able to demonstrate how it could be faked. According to generally accepted information, the film was taken about 1:30 on the afternoon of Friday October 20, 1967 on Bluff Creek in Northern California. The actual site is in the Orleans Ranger District of the Six Rivers National Forest in Del Norte County, very close to the borders with Humboldt and Siskiyou Counties. The nearest town is Orleans in Humboldt County. The only main road to the area is Highway 96, the Bigfoot Highway. Coming from the north, 96 meets Interstate 5 between Yreka and the Oregon border. It is about 140 miles on 96 to Orleans. If you are coming from the south, leave I-5 at Redding and take 299 west about 100 miles to Willow Creek. Turn right onto 96 and go about 35 miles to Orleans. From Orleans, the fastest way in is to take 15N01 (on some maps just called 15) north. The sign in Orleans calls this Eyesee road, other forest service signs alternately refer to 15 as the G-O road. As a side bar, the G-O road was originally conceived in the 1970's as a connector between the towns of Gasquet and Orleans. For political reasons, the final miles in the middle were never completed; that area is now in the Siskiyou Wilderness. Just know there may be multiple local names for the roads, so I prefer using numbers for identification. Be sure to stop into the Ranger Station at Orleans for the latest road conditions; just remember like most Forest Service offices, they are only open weekdays, usually 9:00-4:30. 15N01 is paved all the way to the end at Elk Valley, about 30 miles, but you don't need to go that far. To get to the film site go about 17 miles and take a left onto 12N12, Cedar Camp Road. This road is also paved. Go about 1.5 miles and take a right onto 12N13. In October 2006, there was a small handwritten sign "Sasquatch Road" at this intersection. The road becomes gravel, but was easily passable on my trip. Now you are getting close. At about 3.5 miles take a right onto 12N13H. It's about 2.4 miles down to the creek, but if you are driving a regular car, you may want to walk down. The road is basically okay, but narrow enough to scratch paint at the top. Near the bottom there is a section prone to landslides and covered in wet leaves. My Xterra made it back and forth in 2WD without problems, but a rear wheel drive pickup did a little wheel spinning before getting out. The slightest rain or snow would make it a real challenge. Anyway, 12N13H ends at Bluff Creek. There's a small clearing with a fire ring and two, currently knocked down, bat nesting boxes. Here's where it gets interesting. Some researchers feel the exact spot the film was taken is to the left, down stream. Others feel it is upstream. I spoke with researchers who supported both opinions. I'm not going to name names, or say who's in each camp, but both views have some factual support, and I have a lot of respect for everyone involved. Eventually I spent several hours hiking up and down the creek with print-outs from the film, and I believe it is just not possible to objectively identify the exact location. I did find two large Douglas Firs that could be the one seen in the background of the early frames. The under story in that area is so thick that there is no way to recreate any of the shots from the film. The creek has also moved around a lot over the years and has suffered severe flooding. Also, the road bed that Patterson and Gimlin followed is gone except for a few scattered places. Once you are done at the film site, go back up to 12N13. If you continue west the road descends from the ridge top down into the Bluff Creek valley. After about 4 miles you will cross a concrete bridge (over Bluff Creek), less than a mile further there's another concrete bridge over Notice Creek, and just past this bridge is a left turn into Louse Camp. 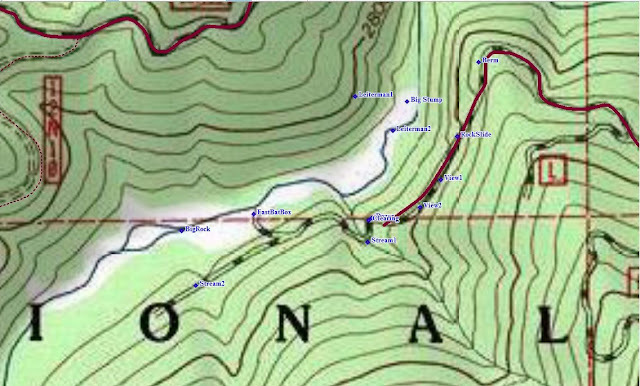 The USGS 7.5 minute quad of the site is called Lonesome Ridge. The National Geographic Topo! Software for California is also very handy. It has all the topo maps for the state on CD, plus you can hook up a GPS and/or download maps to a PDA. The Delorme Gazeteer for Northern California is recommended as a good source of intermediate scale maps. entire area is subject to this sort of thing, so be prepared! only in good weather and with the right vehicle. west to 13N01, this is closed too. High quality image... Click to Enlarge. 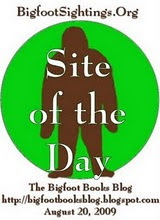 This blog is copyright and all that jazz, save for occasional small elements borrowed for "research" and information or satirical purposes only, 2003-2013, Bigfoot Books and Steven Streufert. Borrowings for non-commercial purposes will be tolerated without the revenge of Angry Bigfoot, if notification, credit, citation and a kindly web-link are given, preferably after contacting us and saying, Hello, like a normal person would before taking a cup of salt. No serious rip-offs of our material for vulgar commercial gain will be tolerated without major BF stomping action coming down on you, hu-man. Critics? How sad. 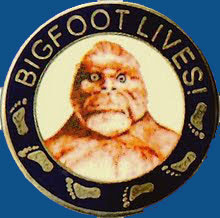 The work you guys did to find the location was the most important stuff to come out in the past couple of years, rightly earning you the "Bigfooter of the Year" award from Bigfoot Times. Even if you guided the assholes down to the creek on horseback, while they listened to a cued audio presentation by Bob Gimlin on headphones -- they would be complaining that you failed to arrange an appearance by Patty... and want a private lunch with John Green too. Great job all the way around. Your work is appreciated. To tag onto my last comment about the coordinates, No disrespect intended. I have a great appreciation and respect for your work and would love to meet you on my next trip. I am just confused because the longitude took me so far east of the area and i would love to have the exact coords. Mark, the coordinates are all right there, just as they were taken with our Garmin devices on the actual film site and all around the area. The PG film is the greatest hoax of all time, don't get me wrong since I am a believer and have had a sighting in Southern Washington but sorry to say Patty is nothing but someone in a costume. Howdy! Planning a trip out there next year and had a few questions. We were planning on parking at the bridge over Bluff Creek on 12n10, then hiking the 2.5 miles up to the PGF site. Is this a feasible hike and what time of year would you suggest going? Hi, well, we have many videos of that hike, if you care to do a search on YouTube for BLUFF CREEK FILM SITE PROJECT. It's a comfortable hike, about three miles total, each way. You might want to bring river shoes or knee-high water boots, depending upon the time of year, depth of water, and your personal style. Much of the hike is actually IN the creek, or crossing it constantly. There are a lot of slippery rocks, so take care and bring a walking stick of some sort. It's very much a gorgeous natural area, so it's worth doing for its own sake, even if you don't make it up to the PGF site. I'd mention that going farther upstream is also nice, and more wild and remote. It's fine when there hasn't been any strong recent rain. Otherwise you'll find the creek is flooded and dangerous. During the later spring and summer is all that the area is open to the public, anyway. From the melting of snow on the roads at high elevation (maybe May, more likely June) to the first rains in October, essentially. One year we couldn't get in there until July. And... use a truck, if you can. Small cars can get stuck on those roads easily.